Arriving late on the first day of boot camp, graduating from U.S. Navy Officer Candidate School without knowing how to float (let alone swim), earning penalties for growing a mustache . . . these are some of the lighter moments* recounted in a book of recollections by Principia alumni who served in the military during the Vietnam War years. With such tongue-in-cheek memories featured alongside narratives of great personal risk and loss, Red Rivers in a Yellow Field: Memoirs of the Vietnam Era movingly underscores the many complexities of wartime service as well as the near-daily, often unremarked, sacrifices and heroism of those involved—in this case, Principians. Speaking to an audience of students and Principia community members at the School on Tuesday evening, the book’s editor, Dr. Robert Craig (US’62, C’66), recounted how he and fellow classmates who were Vietnam veterans got together at their 50th Upper School Reunion in 2011 to swap stories and memories. The encounter, brought about at the urging of his friend Steve Wells (also US’62, C’66), an underwater ordnance expert during the war, eventually morphed into the idea of producing a collection of memoirs. In all, the published book includes 50 contributions—mostly essays, but also a five-part series published in The Christian Science Monitor, a short story, and several poems—from 34 Principians who responded to Craig’s and Wells’s request to participate. What struck Craig about many of the memoirs were the numerous “serendipitous” occasions when Principia alums ran across each other—during basic training, base postings, overseas deployment, and even under enemy fire. Each writer recalls these encounters with fondness and a sense of wonder, as bright moments of comradeship and connection during a period characterized by public disaffection and protest, on one side, and the daily challenges of serving during wartime, on the other. In the introductory “Dedication: The Wall,” Craig writes, “Throughout the country, soldiers, sailors, air men, and marines did the same thing by hundreds of thousands, but from a small school in Elsah, Illinois, a remarkably high percentage . . . volunteered, and each did their fair share.” The majority of alums writing in the book went into the service right out of Principia College, graduating, as Craig puts it, “into a world that called us to war.” A few of them stayed on in distinguished military careers, while most returned to civilian life. 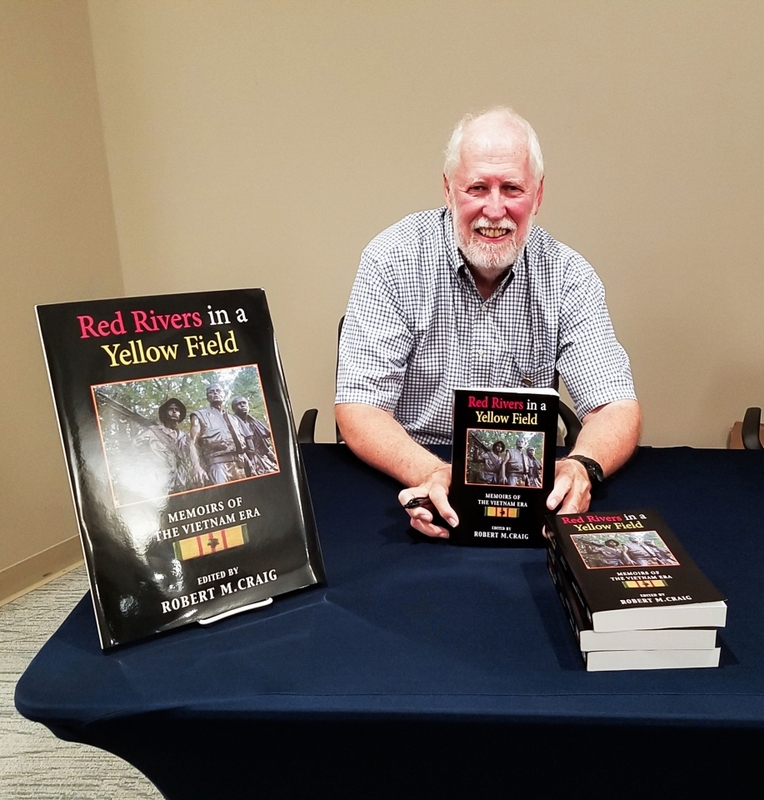 Ultimately, Red Rivers readers come to a similar realization: whether these veterans’ connections while on campus had been in passing or deep-rooted, their shared experience of serving during the Vietnam era created an indefinable and lasting bond. *The three Principians referred to in the opening paragraph are, respectively, Dr. Robert Craig (late to basic training); William Franke (US’62, C’66), who got a buddy to take the swim test for him; and James Chamberlin (C’66), who notes that being “pretty constantly in trouble” during training helped him stay in great shape due to the many pushups and runs he had to do as a result. Note: Red Rivers is available online through several sources, including Amazon. The editor and all writers have agreed to donate all royalties on book sales to Principia.